On Saturday 4th February we are opening our doors from 10-1pm and hosting several workshops, taster sessions and more for the whole family to enjoy as a thank you for supporting us in our new venture at 2 Palmers Road. We have an open for policy and welcome walk-ins but are hosting an extra special day for all of our patients, friends and family on Saturday 4th. Free health and posture checks for children, please book to avoid disappointment. 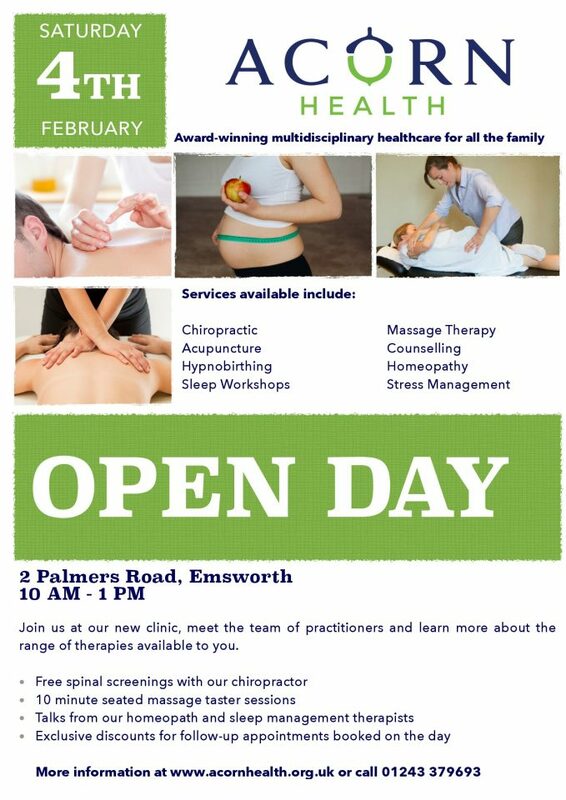 Free spinal checks for adults, please book to avoid disappointment. Seated massage taster session – please book your 10 minute taster session for £10, and if you book a subsequent massage treatment on the day you will receive £10 off your next massage with Cat. Please book to avoid disappointment. Exclusive discounts for booking with us on the day. Talks from our homeopath, sleep management therapist, counsellor and more!